When studying science, we quickly grow accustomed to putting everything into categories. By the time we are in junior high, we’ve probably heard something relating to this: “King Philip Came Over For Good Soup”; what does this truly mean? Literally, it looks as though Philip was a soup connoisseur, but figuratively it is referring to the scientific classifications: Kingdom, Phylum, Class, Order, Family, Genus, and Species. This is what makes science so great – everything is concrete when it comes to the answers. Scientists like to put everything into groups. If everything within nature was simplified, this would be easy, but one cannot simplify the components of the natural world. This is where we find the Aquifoliaceae family; a flowering plant family with only one genus. The American Holly, Ilex opaca, falls under this family. Looking at the plant, it doesn’t seem as though it would fit into the deciduous family, because all the leaves do not fall off at once. It wouldn’t be coniferous because it doesn’t have any cones. The American Holly is considered to be a broad-leaved evergreen tree; it is combination of both deciduous and evergreen trees. This allows the tree to photosynthesize in all four seasons. 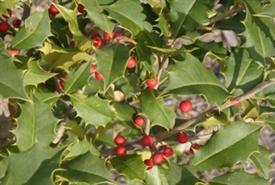 The American Holly is a tree that can grow up to 40-60 feet tall. We have many Holly trees on the Lloyd Center property. You can determine the females from the males by the bright red berries on the braches. Many animals use the American Holly as shelter and as a food source; so while you are all bundled up and walking on the trails, keep your eyes open for this magnificent tree!